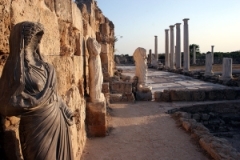 The partially excavated site of the ancient city of Salamis, has fascinated archaeologists for hundreds of years and it is the most important archaeological site on the whole of Cyprus. Nestling on the shoreline of Famagusta Bay, the remains of this once glorious and powerful ancient city have a charm that never fails to excite whatever the season. However, there can be few sites anywhere in the world that are as beguilingly beautiful as Salamis in the Spring. 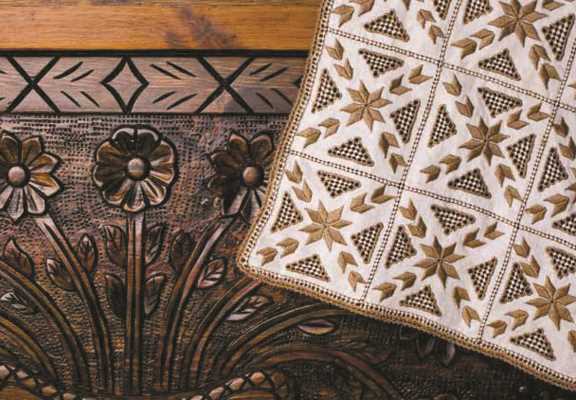 Covered in an array of dazzling wild flowers, the colours of the old and the new blend seamlessly together to create a picture worthy of any great landscape artist. The juxtaposition of a tall Giant Fennel with a smooth white marble column seems not at all incongruous, and in fact each enhances the individual beauty of the other as the huge yellow florets of the fennel appear to mimic the Corinthian carving of the capital that surmounts the column. 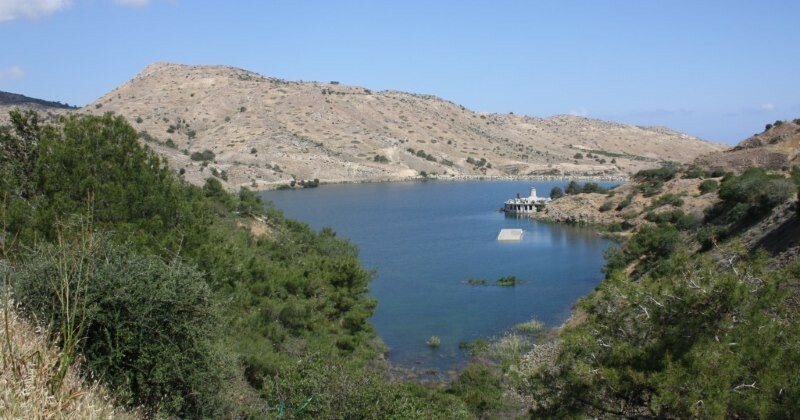 Founded around the time of the Trojan wars, by Teucer, (son of Telamon king of Salamis, a small island off the mainland of Greece,) the settlement built at the mouth of the river Pedios, was named after the place of Teucer’s birth. It was not long before the inhabitants of the nearby, upriver town of Enkomi moved to Salamis where they were able to take full advantage of the superior harbour from which to export their copper. Gradually over the next several hundred years the city continued to develop irrespective of which particular warring faction was ruling at the time. 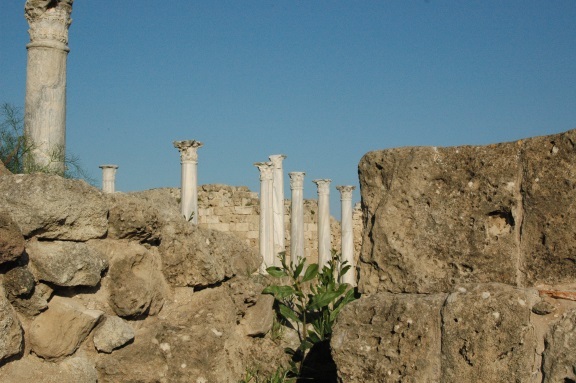 Before the 8th Century BC, Salamis was the most important commercial centre on the island and by the 6th Century BC, ancient texts refer to the city paying taxes to the Assyrian overlords. Despite attempts to revolt against the Persian Empire, it was not until Alexander the Great defeated the Persians that stability returned to the island. After Alexander’s death, the governing powers of Cyprus were the Ptolemys, an Hellenistic dynasty that was ruling Egypt. There were kings of all the city states of Cyprus and the last king of Salamis, Nicocreon fought against the armies of Egypt only to be beaten and forced to commit suicide with his family circa 295BC. The site of his funeral pyre can be found in the village of Tuzla. A vast acreage still covered by the sands of time awaits the shovels of explorers yet to come, but those parts of the city that have been unveiled in the authorised excavations during the 20th Century have revealed a city with Greek foundations, that under Roman rule was totally redesigned and rebuilt as a centre for leisure and pleasure, as well as for commercial enterprise. This was a trading centre for merchandise from the east to be exchanged with goods from the west and Salamis became fabulously wealthy. The rich needed to relax and have fun, so within the city an enormous leisure complex was built consisting of a theatre, amphitheatre, gymnasium and bathhouses. These facilities were available to all Roman citizens and inhabitants of the city, with the exception of slaves. Despite the provision of an amphitheatre, there is absolutely no evidence of gladiatorial combat and certainly no Christians were thrown to the lions! Under Roman rule the city expanded, trading increased, and the harbour which is situated to the south was enlarged. The population of the city grew to approximately 200,000 including slaves, though may well have been larger at the zenith of its power. 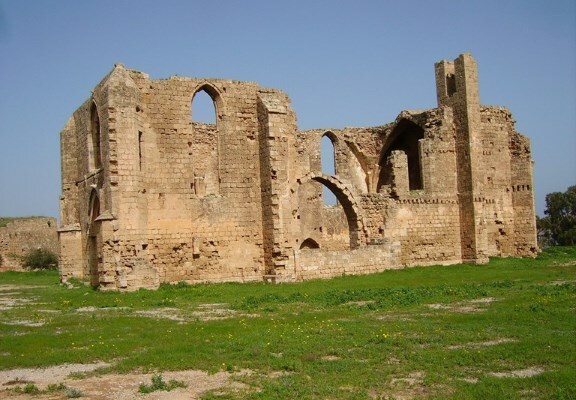 Earthquakes hampered continuing development and successive damage throughout the 2nd, 3rd and 4th centuries eventually forced the populace to move further south to a new settlement that would become Famagusta. Much of the site is not open to vehicular access and it is necessary to walk some distance in order to see all that is available. A cool day is preferable, water and sensible shoes are essential.